When designer Diane (Dee-Ann) Love showed up at the door of the Trifari Company in 1970 to create a new collection of jewelry for them, she was a breath of fresh air, or perhaps whirlwind would be more accurate. As she put it: “I was a surprise!” Trifari was a well established costume jewelry company known for its quality. Their designs at that time were mostly on the conservative side: pearls, chains, button earrings, etc. Don’t forget, Trifari was the company selected to provide jewelry for Mamie Eisenhower to wear to the Presidential Inaugural Balls. And yet, they proved open to embracing an enthusiastic young artist who brought with her exciting new concepts in jewelry design. From the scale of her pieces, to the new finishes, to the hangtags containing historical references, to the packaging, everything about Diane’s designs swept away the staid designs that had immediately preceded them. Diane Love began her jewelry designing career by designing precious jewelry for herself. With a degree in Art History/Studio Art from Barnard she brought to her designs an appreciation for a wide variety of early Byzantine, Egyptian, Medieval, and Far Eastern art objects. These one-of-a-kind art objects, such as a 15th century jade carving, were incorporated into her designs by skilled goldsmiths, and often set with precious stones,. In Diane’s words, she wanted to create wearable art, as opposed to traditional precious jewelry that was the equivalent of “money hanging on you”. These first pieces, when worn by Diane, attracted a lot of attention, and even offers to buy them. At first, she resisted the offers, but then decided that selling them would enable her to continue and expand this venture. She created at least 150 one-of-a-kind pieces which were sold through Bergdorf-Goodman in New York City. Each piece came with a card detailing the history of the art object incorporated into the piece. This first collection generated a lot of publicity, and was very well received. Following the success of the precious jewelry pieces, someone suggested to Diane that she consider creating designs for the costume jewelry market. It was thought that if she did not do it herself, someone else would! So, she contacted the Trifari Company about working with them on a costume jewelry collection. As with the precious jewelry, the concept was to incorporate antique art objects, only this time they would be replicas. Each piece came with historical information about the original art object that inspired it. The collection for Trifari garnered a lot of press, was distributed nationally, and was a hit! Diane designed several collections for Trifari in the early 1970’s. Not all of the collections incorporated antique art object replicas. Trifari produced about 70 of Diane’s designs in total. Included in her collections were: pins, necklaces, collars, earrings, rings, and watches. The price range was from about $15 to $90. During the period of Diane’s collaboration with Trifari, Trifari purchased a Swiss watch company. So, her second collection for the company included 6 to 8 watch designs. Diane’s pieces utilized cast metal, faceted rhinestones, cabochons, molded glass, and molded plastic. One design utilized cast glass components with decals that imitated mosaic stone. She favored bezel settings over prongs because prongs are more modern, and she simply preferred the look of bezels. She also incorporated both hammered and Florentine finishes. She did not like very shiny or slick finishes. Macrame was a popular hobby at this time, so Diane designed pieces that resembled cordwork or passementerie. Molded plastic with an applied “antique” finish was utilized for a replica of a Japanese ivory netsuke. Diane had occasion to visit the Trifari factory in Providence to consult on the manufacture of her designs. Some new processes had to be developed in order to execute her designs. For example, she wanted a black finish on some pieces, which did not exist at that time. Also, the regular 14K gold color plating that Trifari had been using was not the color that Diane envisioned for her pieces. She wanted an 18K gold look which was a bit greener. At first, the manufacturing folks balked at having to do things differently than they were used to, but they relented, and Diane got the results she was after. Diane is a self-confessed perfectionist. She does not compromise on her attention to detail, for it is the details that add up to good design. For example, rather than use stock clasps on her designs, clasps were custom-made. As a final step in the production of her jewelry, Diane designed a vitrine style box for each piece, lined with padded satin and with a clear Lucite top, so that the jewelry could be admired even when it was not being worn. Diane would do the initial drawings for her designs, and head designer Andre Boeuf would oversee the preliminary model-making. Diane would meet with Mr. Boeuf at the Trifari design studio on W 57th St. in New York to approve the model before production began. Often a model would have to be re-worked one or more times before being given the stamp of approval. Not all designs went into production. Designs that proved problematic to produce, or would have been too costly, were eliminated. In addition to the look of her pieces, Diane was equally concerned with their wearability. They had to be comfortable to wear. So, necklaces and bracelets were sculpted to conform to the body. For one long necklace, the link at the bottom was specially shaped so the necklace would hang in a perfect oval when worn. Earrings always had a left and a right model. the original owners, and describes him as a very nice, distinguished gentleman. She was pleased that, despite difficulties, they were very good to her, and let her do what she wanted. Diane was the first “outside” designer to have her name attached to a Trifari collection. Two examples of Diane Love’s designs for Trifari are pictured on page 337 in the book Jewels of Fantasy, known to some as the “bible” of costume jewelry. The first design is a large copper tone medallion, a replica of a Sassanian plaque, 5th century BC, hung on a combination gold/copper tone necklace inspired by middle eastern scroll motifs. The second design is a “man in the moon” theme necklace and bracelet set with a black finish, accented with rhinestones. The crescent shaped moon-with-face design was modeled after a French Directoire horse bridle ornament. Another design incorporated a rampant mythical lion, or shi-shi, with a curly mane. The 4 headed bird brooch design pictured here was modeled after an ancient Luristan bronze, and was worn frequently by Barbara Walters when she was hosting the Today Show. 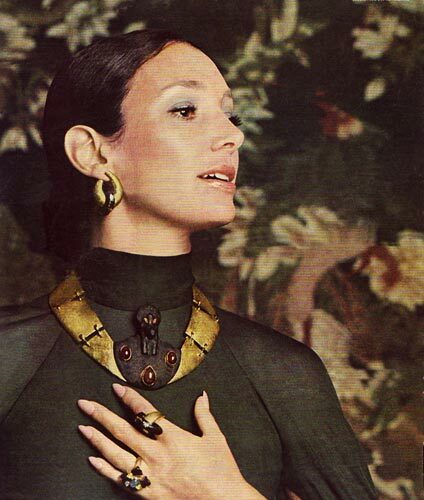 Diane’s vibrant designs for Trifari helped to usher in a Renaissance of wildly creative costume jewelry that continues to this day. Entire site copyright ©2005-2008 The Trifari Collection. All rights reserved. Site design by Eureka, I Found It!.